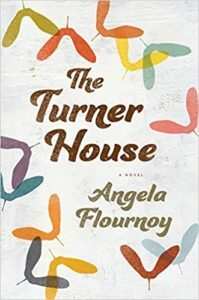 The Turner House by Angela Flournoy is about a large African-American family in Detroit. Viola and Francis Turner lived on Yarrow Street in Detroit for fifty years, where they raised 13 children and saw the neighborhood turn from vibrant to dilapidated. Francis is now dead, and Viola, in ailing health, lives with her oldest son, Cha Cha, in the suburbs. The house is still standing, though, and Viola owes more money on the mortgage than the house is worth. The question of what to do with the house sets the plot of The Turner House in motion, as the Turner siblings deal with their own feelings about the house, their parents, their siblings, and the state of their lives. I had heard good things about The Turner House before I picked it up, and in theory, I should have liked it. It’s about a large sprawling family, told from shifting points of view, with complex relationships between siblings. But honestly, I found it pretty boring. There’s a large subplot about the haints, or ghosts, which have plagued Cha Cha since he was a teenager. I couldn’t really get into it. I enjoyed following Lela’s story, the youngest sister who has a gambling problem. But that wasn’t enough to save this book for me. I slogged through it and was happy when it was done. Too many siblings, many of whom never got any airtime or distinguished themselves from the others. Too little resolution – we don’t even find out what ultimately happens to the house in the end. And frankly, not enough conflict. The family is big and messy but they basically all get along and no one really does anything too terrible. I would have enjoyed hearing more about growing up with 12 siblings and how it impacted each of the kids. I would have enjoyed hearing about what meals were like, what doing homework was like in a small house with 15 people in it. Instead, I had only a shadowy sense of this family, and way too much information about Cha Cha and the haints. I listened to The Turner House on audio. It was narrated competently Adenrele Ojo. She did a good job differentiating the featured siblings and I liked her voice and narration. But she couldn’t save a boring, meandering plot. Sadly, I can’t recommend The Turner House. Based on the reviews I read, a lot of people enjoyed it. It just wasn’t for me. Posted on March 16, 2017 by gayle. This entry was posted in Audiobooks, Fiction and tagged angela flournoy, audiobook, the turner house. Bookmark the permalink. I agree with everything you said, Gayle. Like you, I listened to the book, and by far my favorite part was the narration — I liked the narrator’s voice, and think if I had read the book, rather than listened to it, I wouldn’t have stuck with it. I simply found the book very dull, and wondered what I was missing.